﻿ Riad El Mess Essaouira. JIMAT di Agoda.com! Ada soalan mengenai Riad El Mess? Terletak pada kedudukan yang baik di kawasan budaya, siar-siar di bandar Essaouira, Riad El Mess menyediakan tempat yang paling sesuai untuk anda berehat seketika dari kesibukan hari anda. Dari sini, tetamu boleh menikmati akses mudah kepada semua yang bandar meriah ini boleh tawarkan. Untuk pilihan bersiar-siar dan tempat daya tarikan tempatan, pelancong tidak perlu pergi jauh dari hotel kerana ianya berdekatan dengan Fikra Shop in Morocco, Le Souk, Chaim Pinto Synagogue. Kemudahan dan perkhidmatan yang disediakan oleh Riad El Mess memastikan penginapan yang menyenangkan bagi para tetamu. Hotel ini menawarkan Wi-Fi percuma semua bilik, Wi-Fi di tempat awam, khidmat bilik, restoran, khidmat dobi untuk memastikan tetamu menikmati keselesaan yang terbaik. Hotel ini mempunyai 8 bilik yang sangat cantik, setiap bilik dilengkapi peti ais, kelengkapan tandas, pancuran, mesin basuh, kawasan tempat duduk. Hotel ini menyediakan kemudahan rekreasi yang baik seperti rumah urut untuk membuat penginapan anda benar-benar tidak dapat dilupakan. Riad El Mess merupakan tempat yang ideal bagi penginapan pelancong yang mencari keindahan, keselesaan dan kemudahan di Essaouira. Me and my girlfriend stayed 5 nights here, awesome place with a really nice manager. He was always around and went out of his way whenever he saw us to ensure we were ok, he genuinely cared and was generally a really nice bloke!! Also nicely located with great breakfast (they will serve it whenever u wake up)!!! good riad, next to the city center, ordinary breakfast and not windows in the rooms but great atmosphere. First of all, the internet couldn't use at the room. The shower drain was always stuck and not so cleaned. Is well positioned within the medina. Nice view from the rooftop. Quite a basic little Riad, rooms are a decent size but very simple, a bit spartan even. But certainly clean and well maintained. Good for the budget traveller. Staff were pretty good. Unfortunately I put in laundry the day before I was leaving, as they promised it would be ready for when I left. It wasn't! Had a rather anxious time waiting for it to turn up causing me to be late for my departure. I also sat in the breakfast room one morning for 40 minutes waiting to be served, but was ignored. You gets what's you pays for. the view from the terrace is serene and peaceful where you can hear the sea breaking along the nearby sea wall. there are ample locations for private sunbathing. the rooms are really located upon two floors with many sets of spiral staircases to the main floor fountain with lots of relaxing lounge areas. the rooms are basic but the bed i slept in was comfortable and cool; there is no need for air conditioning as the walls are thick enough to retain and release coolness through the night. 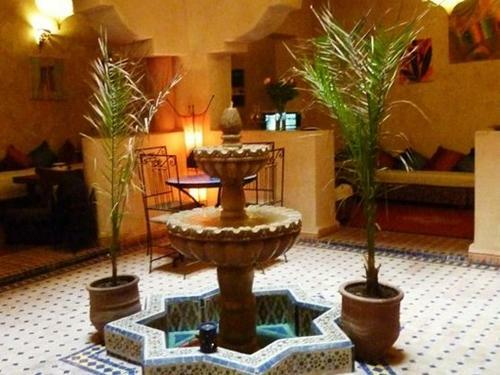 this riad had an authentic and elegant rustic charm. the staff were welcoming, kind and genteel. location is directly accessible from supratour straight through the market with luggage porter. Thoroughly enjoyed our stay in Riad El Mess. The riad itself is beautiful, authentic Moroccan and within the medina itself, just a walk away from all the restaurants and shops. We were given a great room, Room4, and it was huge with a huge comfortable bed and covers, bathroom, couch and chairs. Hot shower was always functional, never had to take a cold bath in cold Essaouira! The free breakfast was simple but great, they'd serve you even if you woke up at 11am :) The hotel's best asset is its staff, just wonderful, helpful and very friendly. Yisham in particular was very kind and exceeded our expectations, helped us throughout our stay. Это был наш единственный отель в Марокко, который мы взяли внутри медины. Один раз поробовать стОит, потому что это разительно отличается от всего остального :) Медина очень тесная, много людей, детей, животных. Все чем-то торгуют, постоянно окликивают... Долго находиться внутри медины некомфортно. Отель поразил своей тишиной и спокойствием. Находясь практически в самом недре медины, вы можете почувствовать себя в уединении :) Впрочем, звук из окна будет напоминать вам о том, где вы находитесь. Завтрак позднова-то (с 8 утра), пришлось выехать раньше него. Обед/ужин в отеле заказать нельзя (нет кухни), но до местных едален (включая рыбный рынок внутри медины) рукой подать.